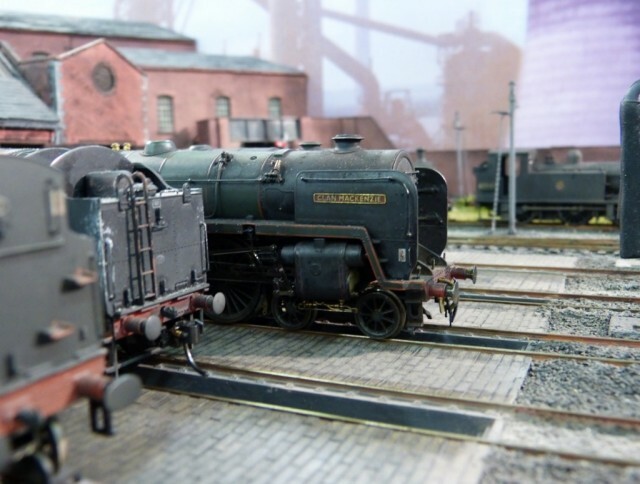 12AD Model Railway Group came about at the 2013 Perth show where Milton Street MPD made its debut on the exhibition circuit. Three of us had been working on the layout for a few months and found that as a team everything worked really well. We all got on great with each other, bonded well and had the same vision for the future. Our small team ended up in a local hostelry on the Saturday night of the exhibition and whilst partaking of a few pints of the black stuff we started discussing the possibility of forming a small group of like minded people, who have their own layouts, with the intention of hopefully attending a couple of shows each year with these layouts. The enthusiasm was obvious and so we decided to proceed with the first task being to come up with a name for the group. This was talked about at length and the name we came up with has a personal reference to all of us. Eaglesham by Bill Auld, a Caledonian Railway station and yard layout set in 1912. Milton Street MPD by Spencer Anderson, a Motive Power Depot set in Motherwell depicting the final years of British Railway steam. Rockvilla Goods by Joe Loftus, a goods yard based in Glasgow’s Possil area, in the early 70’s ‘pre-TOPS’ era. In addition to the members above, another member is Keith Brown, the youngest member of the group. Keith is a relative newcomer to the hobby and is as enthusiastic as the rest of us, so it is a pleasure to welcome him into the fold and hopefully we can develop his skills and knowledge as we progress. We have all been involved in a sizeable club situation before and have decided that our small group, will remain a small group.